to the public when they visit these establishments. Click on the thumbnail for the full size photo. Use your browser "Back" button to return. 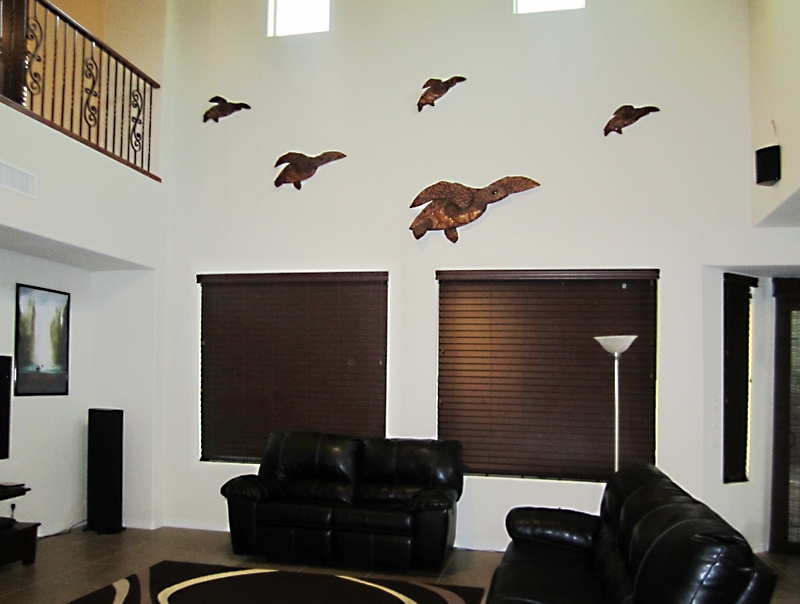 This home in Gilbert, Arizona, proudly displays a wonderful grouping of Sea Turtles carved in Alder wood. The wood tones compliment the flooring and also create a great visual contrast with the black leather furniture. Note the visual movement across this large wall, a current running to the right. With large walls, areas over windows and balconies give the client spaces to place dramatic artwork. 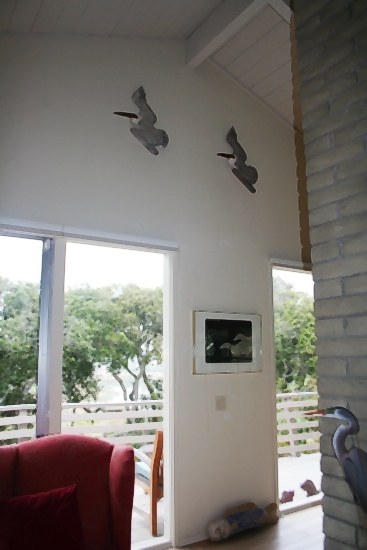 This home in Carmel, California, proudly displays the two flying Pelicans above the sliding doors to the outside. When placed in sets of two or more, they make a striking statement for a home with sea life as a theme or near the ocean as in Carmel. 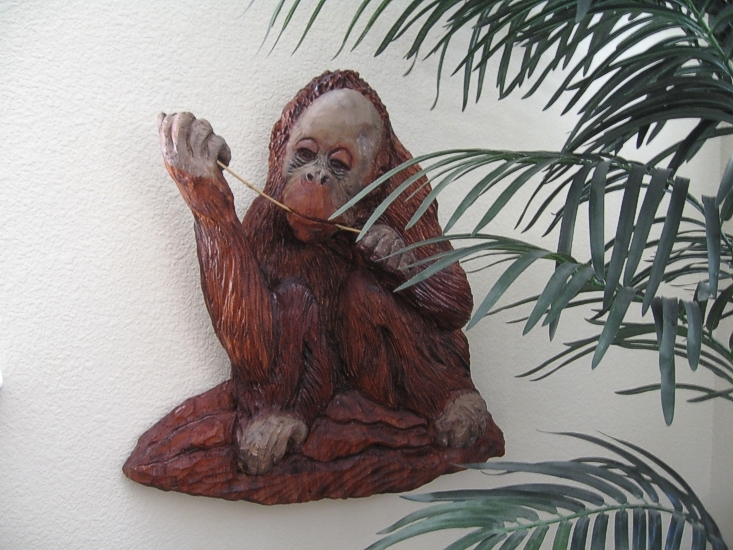 Measuring 29" X 31", they are carved in Alder wood with a Mahogany beak. 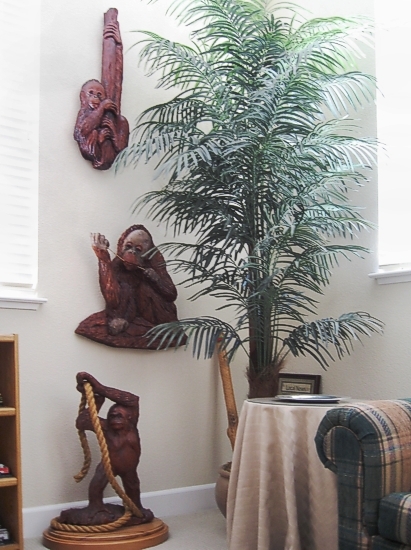 This display of baby Orangutans with the tree adjacent to the pieces in this Morgan Hill, California home creates a fantastic corner display. The two wall sculptures are complimented by the three dimensional piece on the floor. 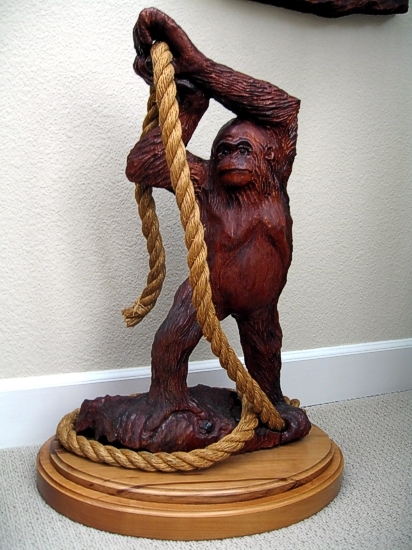 The 30" baby Orangutan is holding a piece of Manila rope and ties the entire group together. 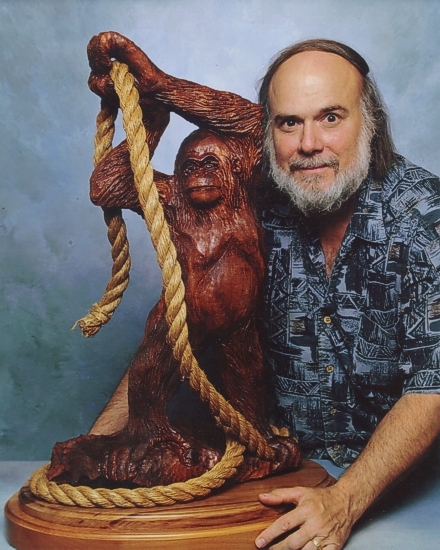 Below are individual shots of each piece, and Richard with the sculpture at the Wal-Mart Photo Department! 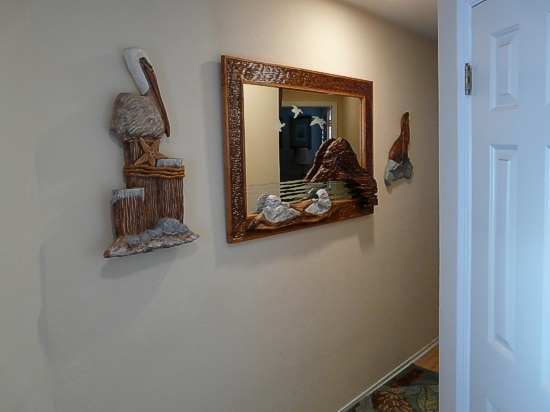 This Morro Bay, California home has a sea life mirror in the hallway depicting the famous Morro Rock as a focal point along with twin sea otters along the bottom. Notice the etched areas in the mirror depicting waves, Pelicans and Gulls flying. Carved in Alder wood, measuring 31" X 47", this mirror opens an area visually creating a stunning display. 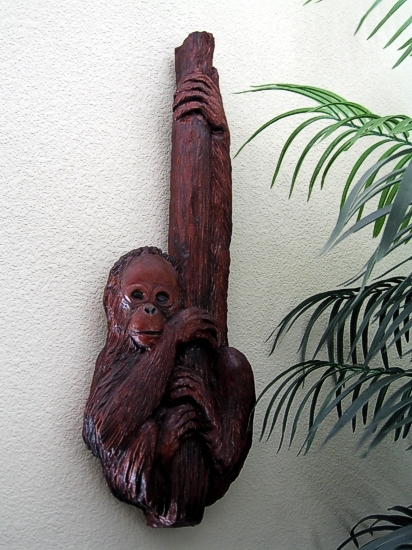 This lighthouse carving in Red Gum really stands out against the wall and fireplace of this Los Altos home in California. 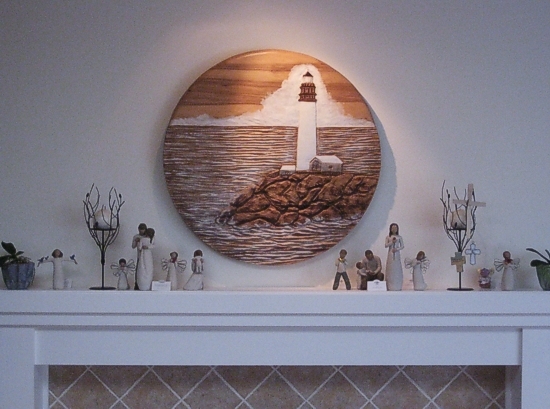 The piece is 30" in diameter and is highlighted by a soft light for additional effect. 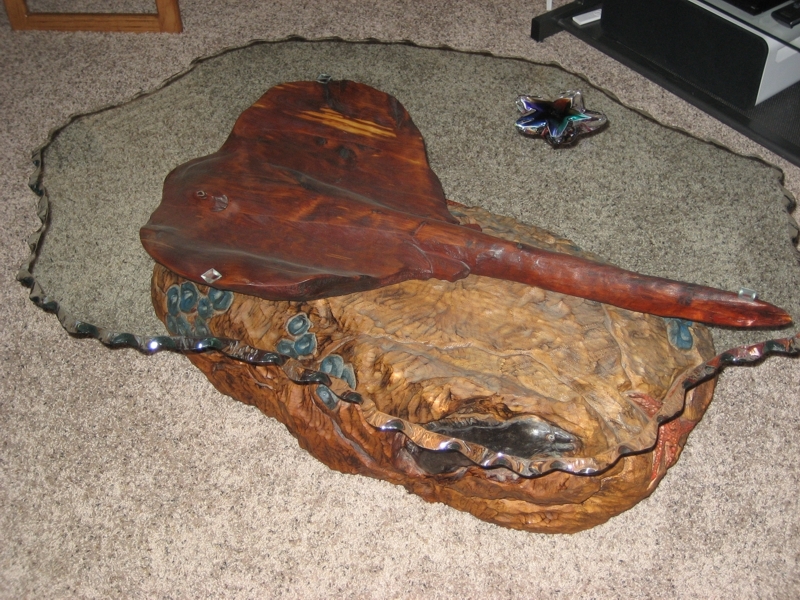 In the same Los Altos, California home as the round Lighthouse sculpture pictured above resides this unique, commissioned Starfish theme table. The area carpet continues the Starfish theme and their kitty, in typical cat behavior, decided it was really his. 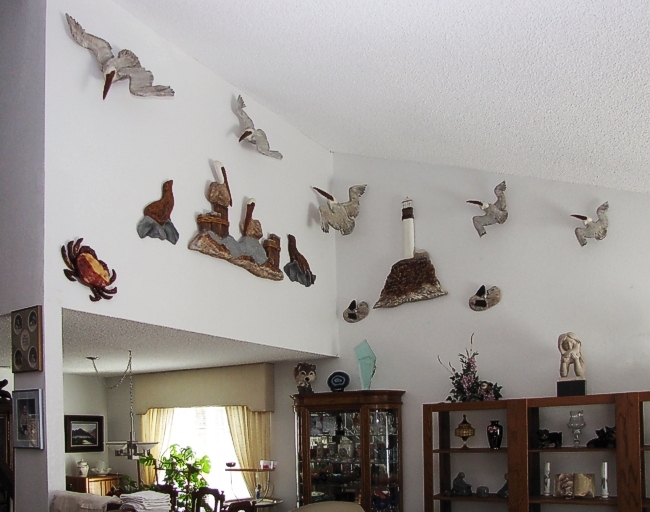 This Fremont, California client has created a fantastic dual wall display. Utilizing the Twin Horizontal Pelicans as a center, the display also uses Seals, Otters, a Lighthouse, a Dungeness Crab and a flight of five Pelicans! 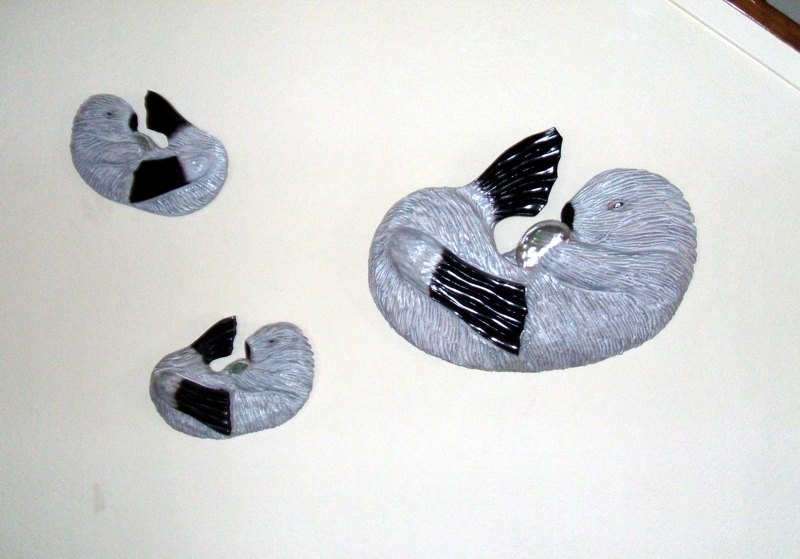 The Pelicans have been spaced away from the wall 2", and the corner Pelican is 11" away from the center of the corner. The shadows created by the spacing vary as the day progresses, creating an almost lifelike environment. 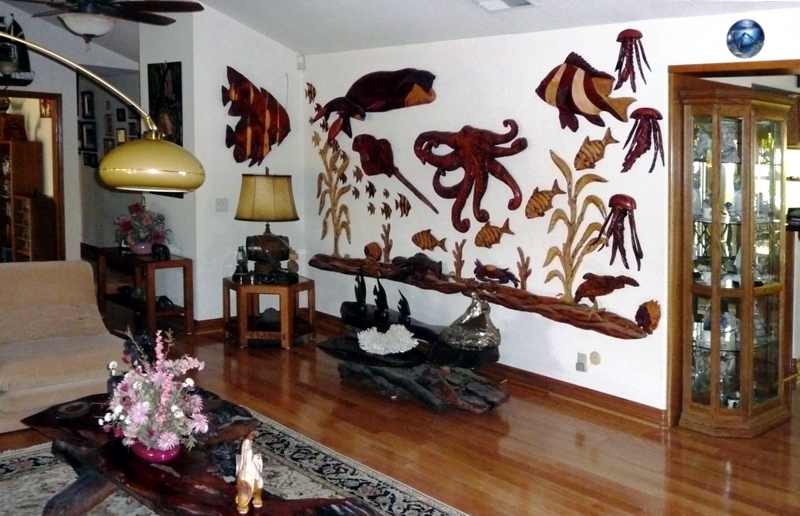 This home in the San Diego area displays a diverse collection of Richard's sea sculptures on this fourteen foot long wall. This client has been collecting Richard's work since the early 1980's.This underwater motif has the feel of movement with the recently added jellyfish in the upper right corner. 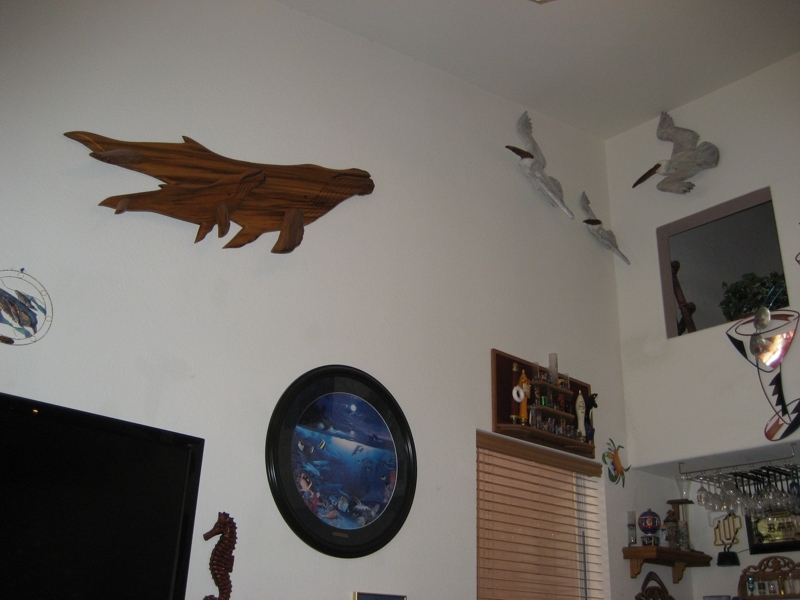 This home in Morro Bay, California shows a grouping of three Sea Otters with whitish staining. The mother Otter is near the two baby Otters and together they make a wonderful sea display, suitable for any home and extra special by the water.